But is it finger-licking good? 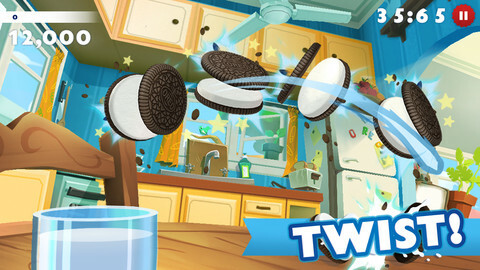 If you can say nothing else about OREO: Twist, Lick, Dunk it's that the title alone leaves you with no uncertainty about what you're going to be doing. Because of this, you're first reaction to the game might well be to think that building a game around childhood's most traditional and cherished form of messy eating is a bit of a stretch. For the most part, you'd be about right. 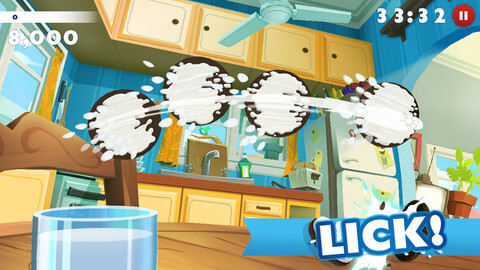 In a kitchen scene, random handfuls of OREOs are flung into the sky like little clay skeets. Your job is to first swipe through each set of OREOs to separate the biscuits with a twist. Then, while they're still in the air, you need to swipe through them all again to stick them together with a juicy lick. Finally, you need to dunk the mega-cookie into the glass of milk on the table before it's on to the next set of two, three, four, or even five flying cookies. Points are awarded for each stage of preparation. You've only got one minute to get the highest score possible, but at the end of each attempt you're awarded a certain number of game coins depending on your score. These can be spent in the cash shop to buy new OREO varieties, which not only confer points bonuses when they appear within the game but also unlock a brief history of each limited-edition biscuit. The thing is, once you've played the game once, you've really played it a hundred times. Yes you can go for a new high-score, but new high-scores come from spending your coins on those new OREOs. Once you've spent more than ten minutes with this arcade game, all of your successes are really just a symptom of how much marketing message you're willing to absorb. OREO has a neat little gimmick that's executed very well but that's really all it is, and the bulk of the game is exactly what you'd imagine it to be: marketing. You'll certainly get a quick blast of fun from this entirely free download, but you'll soon be left feeling hungry for something just a little more substantial. What's Hot: A well-executed, if rather thin, gimmick that's fine for killing ten minutes. What's Not: Fun for a go or two, but you'll soon dip back into a different game.